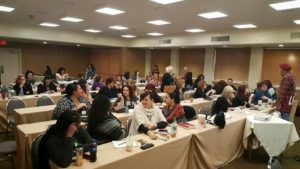 Higher Road for Education is a two day (February 25-27, 2017) jammed packed of continued education for professional nail technicians. Each day is full demonstrations and classes that are not product specific. Secondly, these weekends create opportunity for professional nail technicians to come together and network. There are many great friendships made at these kinds of classes. The tips, tricks and techniques learned in these classes are beneficial for producing a smarter and more efficient ways to create nail enhancements, nail art and business skills. 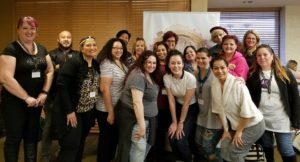 I have attended several of these HRTE workshops in years past and find that its well coordinated and truly some of the best professional education you can ask for in the nail industry. The line up of educators always sell seats so I knew to sign up early, and I appreciate that each educator is willing to go the extra mile to help you succeed. Tammy Ferrera Warner, who created HRTE has become a pioneer in coordinating these kinds of education classes. During this particular weekend, Amy Becker taught best practices in hard gel application. Max Estrada shared his concepts in Stiletto shapes. I especially liked Tony Ly and his way to cut acrylic with a tool. The Profile girls, Traci Dunigan and Ami McClure always teach awesome and easy nail art designs. If you are a professional nail tech and have an opportunity to take one of The HRTE classes across the nation, totally do it. You will not leave there disappointed or feeling like you didn’t learn something new or without a new nail tech friend. I am so grateful I can attend when I have the opportunity.